It is a small area of grass and trees just off the Kensington Expressway on Mulberry Street. A community leader sees it as a way to help turn around a community riven by violence. At one time, Buffalo had dozens of tot lots - small local urban parks - across the city. They faded away for budget reasons and because they were so hard to maintain. One piece of property in the Fruit Belt drifted into private hands and now is owned by the Fruit Belt Coalition. It is marked by a now-decrepit gazebo, which Coalition President and CEO Benjamin Cashaw said was provided by a neighbor. "That was given to us by that dear, sweet lady sitting over there, Miss Atheria Ware," Cashaw said. "That's one of the, think about it, 10 or 15 what they call pocket parks that used to exist in the Fruit Belt until they started developing it. But that one was so nice because it had a little gazebo in it." Cashaw is looking for a way to renovate the gazebo. Cashaw said the one-time tot lot can once againl be a place for families to spend some quiet, quality time. During this year's hot, steamy summer, the Fruit Belt has suffered through a rash of murders, even a 17-month-old child on Grape Street. But neighborhood activists say there are good things occurring as the community grapples with overflow issues of the Buffalo Niagara Medical Campus. The neighborhood is also benefiting from changes in parking rules. Gov. 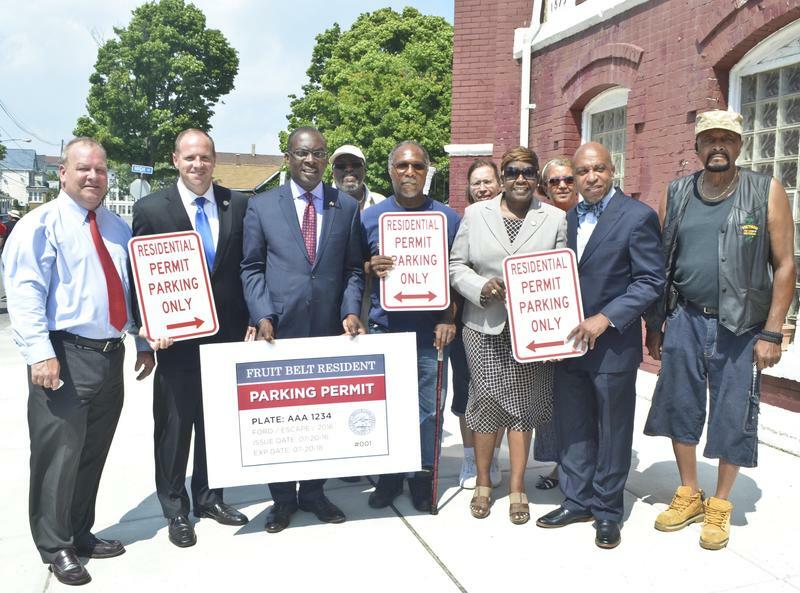 Andrew Cuomo has signed legislation extending for three years a new system that gives Fruit Belt residents first crack at the community's scarce parking spaces. With the increasing development of the BNMC, parking spaces have been overrun by workers and visitors who don't want to pay to park, preferring to look for free spaces under the fruit trees. "The coalition fought that tooth and nail," Cashaw said. "It was 10 years coming, but we just got it locked back in place for another three years. Now we can finish getting it cleaned up." For many residents of Buffalo's Fruit Belt, recent years have been a battle, trying to save the community against the all-enveloping Buffalo Niagara Medical Campus and developers. The neighborhood now has new weapons to save an old community. An outcry from Buffalo city residents has been heard by local politicians and lawmakers in Albany.